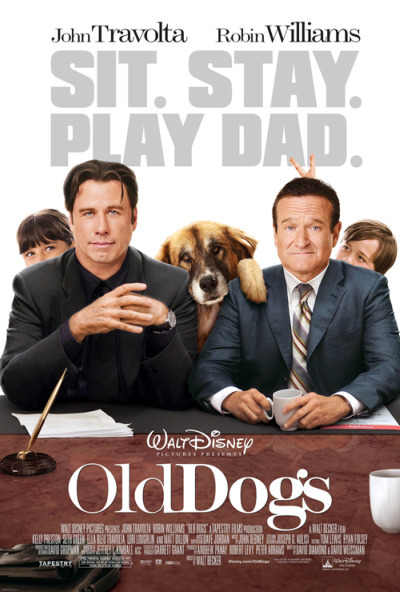 In a long line of Disney formulaic movies comes another, namely Old Dogs, which focuses on best friends and business partners Charlie (John Travolta) and Dan (Robin Williams). About to make their biggest deal with a Japanese company, Dan discovers that he is the father of two fraternal twins, and due to some strange circumstances, finds Charlie and himself taking care of both of his children for a couple of weeks. In true Disney style, Old Dogs has nothing that is all that unique – the story is cliche, formulaic, and is full of slapstick humor. However, though cliche, one has also come to expect Disney movies to produce feel-good, light and happy movies, and Old Dogs definitely fits this mold and fits it successfully. Don’t expect this one to win any Oscar awards, but it’s not meant to. It’s meant to make you laugh. And laugh I did. Non-stop. It’s been a while since I’ve seen a movie that made me laugh out loud, uncontrollably, almost in tears, but Old Dogs succeeded. There is a scene where Dan is at the golf club with the CEO and son of the Japanese company, and Charlie is at a bereavement meeting with Amanda (Lori Loughlin) that particularly tickled my funny bone. The scene seen from the trailer with the gorilla hugging Seth Green was also quite a hit with the audience. John Travolta and Robin Williams truly steal the show here, and the chemistry between the actors work unbelievably well. The cameos were hilarious and each role they were perfect. Old Dogs is fairly family friendly, if you’re looking for a good movie that you can take your kids to. This movie isn’t going to be full of witty humor (my favorite kind of comedy), but if you’re looking for a movie over Thanksgiving that just gives you some giggles, some silly entertainment, Old Dogs is the one to go to. Many people have compared this movie to Wild Hogs (also directed by Walt Becker), and in many ways, it’s very similar, but I actually enjoyed Old Dogs much more. The story was more appealing to me and I laughed a great deal more. If you liked Wild Hogs, you’d probably like Old Dogs. If you didn’t, I’d say avoid this one. Recommended! 3 old dogs / 5 old dogs.